Recent export trends are less about exchange rates than energy prices and ongoing structural changes. For policy makers this puts the emphasis on fiscal and regulatory, rather than monetary policy. For investors, this increases the value of investing in more situationally-aware and nimble companies. 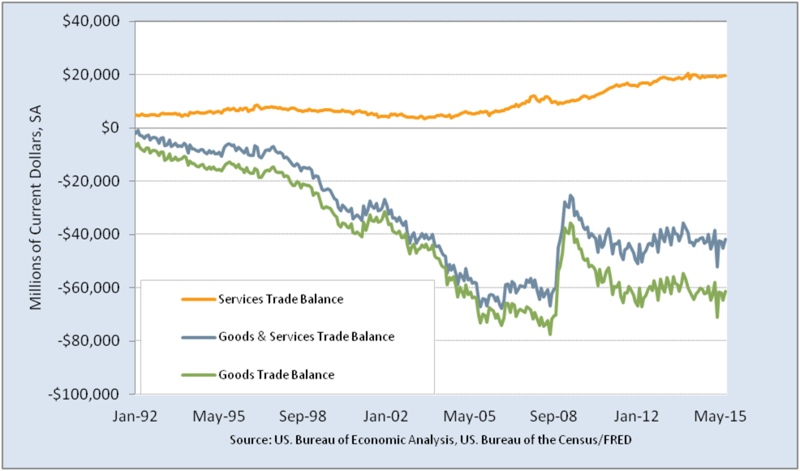 The slide since November 2013 in the Goods and Services Trade Balance (blue line below) is the troubling headline. 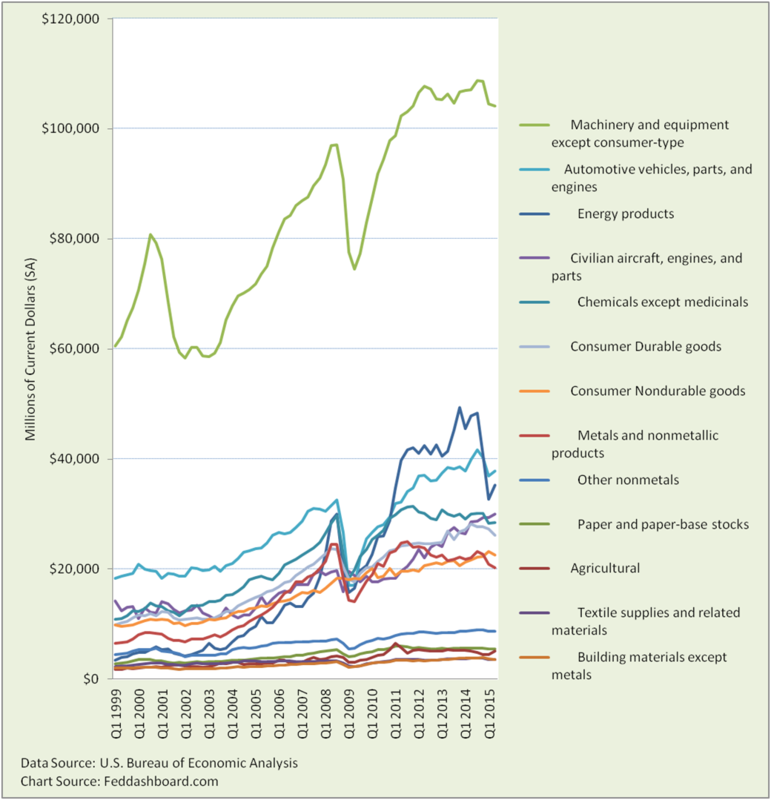 Good news is the upturn in 2Q2015, but the underlying trend may still be there. Our analysis of exchange rates and “liftoff lightheadedness,” left inquiring minds wanting to know more about export specifics. To find out, we start by separating the goods from services – the trends over time are quite different. Goods have been more stable than pre-credit crash. Yet, this chart can mislead as it is not adjusted for the past 3 decades of change in prices, consumption or broad Gross Domestic Product (GDP). Holding exports constant for GDP adjusts for overall size of the economy and roughly adjusts for prices. Compared to GDP we see Net Exports of Goods historical weakness, post-crash improvement and stagnation since 2Q2014. An export rally peaked in 3Q1991. The bump is seen in the strength of net exports relative to GDP since 2011. This is much more striking than in the nominal data, especially in services. Today’s growth can also be seen as continuing a climb from 2006. 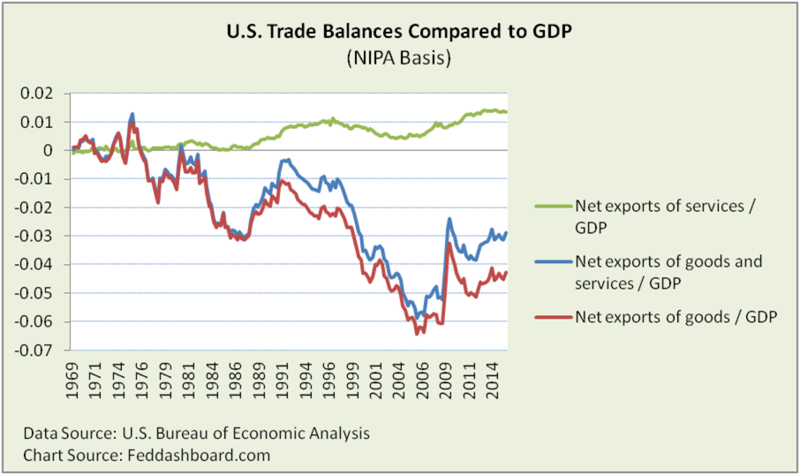 Yet, balances are “net” (exports – imports). So what is happening with specific export products? To discover, we dig through aggregate averages down to the Bureau of Economic Analysis International Transactions detail. This data is nominal. This reveals the source of the recent drop and slight rebound in exports. It’s the oil slick. The slick – energy, led by petroleum, is the largest culprit in both the drop of the past year and the BEA’s recent report of strength in 2Q2015. Because this data is nominal, the price drop (more than quantity) pulled down the nominal shipments and reflects the rebound. In addition, some products (Machinery, Chemicals and Metals) have negative situations that predate the spike in USD strength a year ago. Knowing the news about any of these product groups reveals individual stories. Exports have stagnated since 3Q2014, but it’s not just about exchange rates. In a policy sense, “fixing” exports isn’t a job for monetary policy as much as it is for fiscal and regulatory policy. In a business sense, it is about investors, boards and managers aligning around better business models and initiating all projects the grow value. Until then, “authentic alpha” fundamental investors can prioritize those companies that more quickly adapt to their environment.